The Selene videogame created by the Center for Educational Technologies has been named a finalist in the International Science & Engineering Visualization Challenge. The National Science Foundation (NSF) and the journal Science created the International Science & Engineering Visualization Challenge to celebrate the grand tradition of science visualization and to encourage its continued growth. The spirit of the competition is to communicate science, engineering, and technology for education and journalistic purposes. Selene: A Lunar Construction Game is one of the top 10 finalists in the games and apps category of the Challenge. Entries are scored by a panel of distinguished judges representing a variety of fields, including scientists, engineers, film producers, and graphic artists who are chosen jointly by NSF and the journal Science. Winners are expected to be announced later this month and will be featured in an upcoming Science issue as well as on its companion website, Science Online. 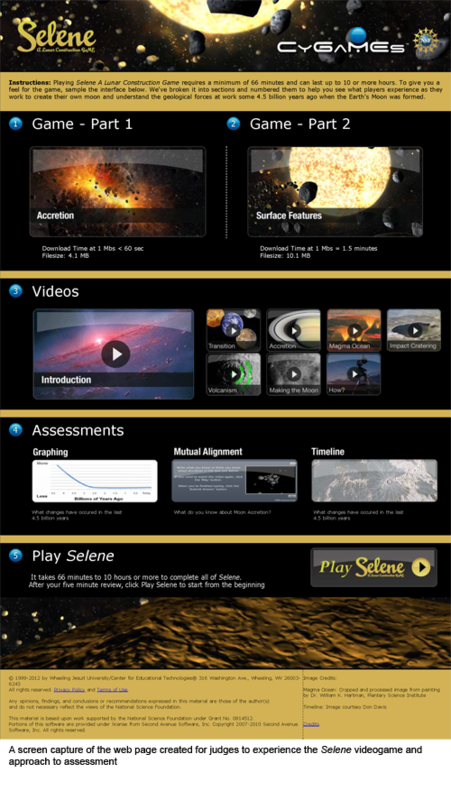 The first version of Selene was a semifinalist in the 2007 International Science & Engineering Visualization Challenge. The award-winning game originally was funded by NASA to study how to best use videogames in the teaching of NASA science concepts. The current version of the game is now part of the NSF-funded CyGaMEs project, an approach to instructional game design and embedded assessment. "Earning honors as one of the 10 games or apps finalists internationally earns CyGaMEs and the Selene game the kind of credibility that speaks to educators and the public," said Debbie Denise Reese, senior educational researcher at the Center for Educational Technologies and principal investigator for the project. "This recognition goes beyond our reach through research publications in professional journals or awards from professional organizations. It opens the opportunity for more students to benefit from Selene—and perhaps engage with science in school and beyond." In Selene players learn difficult geological concepts like accretion, differentiation, impact cratering, and volcanism by applying these science concepts to help players move toward the game's goal of building the Earth's Moon. Players construct the Moon, then blast it with impact craters and flood it with lava to experience how our Moon formed and changed over time. All through the game Selene tracks each player's behavior to measure learning and the player's response to the game environment. The game features the work of three accomplished scientists. Reese created the assessment and instructional concepts of Selene and has earned national awards for the game's design. Chuck Wood, director of the center, is a renowned lunar scientist who spent years with NASA training shuttle astronauts on lunar observation, and he also operates the Lunar Photo of the Day website. He guides players through Selene in a series of video segments that explain the Moon's geological history. And Barbara Tabachnick, professor emerita of psychology at Cal State Northridge, has served as a consultant throughout the project. She recently earned the lifetime achievement award from the Western Psychological Association for her 40 years as a research design/statistical consultant. "Our research shows that the CyGaMEs approach to instructional game design offers a great opportunity for learners to wrestle with challenging Earth and space science concepts targeted by the Next Generation Science Standards and the Framework for Science Education," Reese said. CyGaMEs offers authentic, performance-based assessment, she added. "We can actually show players and educators what students learn and when." Selene debuted its Spanish language version this fall. "Because the game is now bilingual," Reese said, "it supports the type of dual language (Spanish and English) approach to teaching and assessment mandated by the federal government and organizations like the Council of Chief State Officers. We are partnering with the National Association for Bilingual Education to conduct focused work on implementing dual language games in science, technology, engineering, and mathematics classrooms." Both versions of the game are free online and available 24-7. Players ages 9-18 and adult recruiters, who confirm players' ages, get parental consent and gather other players, are always needed to help with the CyGaMEs research. To sign up as a recruiter or play Selene, visit the Selene website or contact Selene. Among past honors for Selene, it has earned the Association for Educational Communications and Technology Design and Development Best Practice Award both in 2008 and 2011. Disney Research named the Selene game and CyGaMEs research one of 15 finalists worldwide in its 2010 Learning Challenge Competition.